The Guitar Column: Fender Custom Shop 1960 Relic Stratocaster Owned by Michael Landau on eBay! Fender Custom Shop 1960 Relic Stratocaster Owned by Michael Landau on eBay! 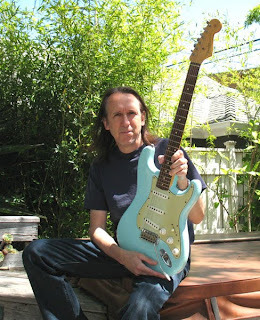 Here's an eBay listing for a Relic 1960 Fender Custom Shop Stratocaster owned by Michael Landau! According to the seller LA Vintage Gear, this Sonic Blue Strat was specially built for Landau by the Fender Custom Shop in 2002. And for many big name pros that usually means a visit to the custom shop to hand-pick choice bodies and necks out of the batch. A privilege for the lucky few! And if there's anybody that knows what he wants in a Strat, it's Mike. Weighing in at 7.8lbs, this axe comes with all accessories and a Certificate of Authenticity. And here's a link to a Mike Landau-owned Tyler Studio Elite!